…AND earn extra income directing their own films, making commercials and from monthly residual checks from their previous shows. …AND also profit from endorsing merchandise from energy drinks to beauty products. …AND rake in more cash from the royalties earned by their older ones. None of this is probably new news to you. But the more important question is what all these celebrities have in common. Every single one of them have all created ADDITIONAL SOURCES OF INCOME for themselves. Maximize their talents, core competencies and strengths. Earn a few extra bucks on the side. Expand their exposure, marketability and their personal brand. Keep some revenue flowing in case their main source of income is unexpectedly cut off. 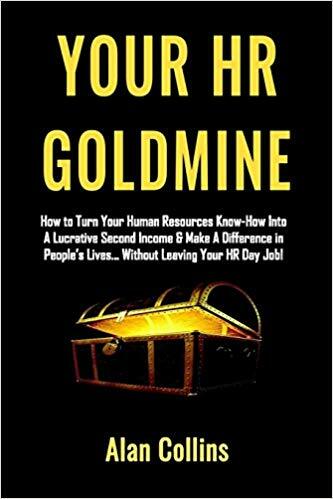 And it’s for all of these reasons that I am a relentless advocate of taking what you already know about HR…and turning it into multiple streams of income too! For the last fifteen years, I’ve not limited my income to just my HR day job. 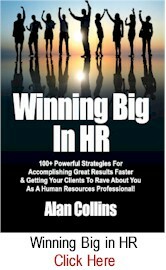 I’ve produced revenue from HR consulting; writing HR books, white papers and special reports; speaking on HR topics; and coaching HR professionals. It’s my passion and it’s a thrill. But frankly, there’s nothing special about me. 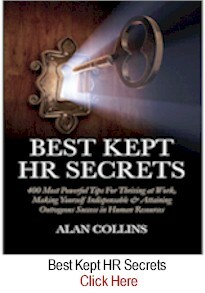 There are many others in HR that are doing the same thing and doing it…EVEN BETTER. Carole was a corporate HR Manager for 15 years. 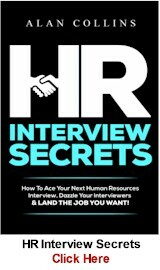 Today, she is as made interviewing her specialty and is an expert in the use of behavioral interviewing techniques. She has branded herself “The Interview Coach” and runs her own business. She speaks at conferences, business meetings, and classes on interviewing and salary negotiations for both interviewers and interviewees. She has published articles and authored the Interview Fitness Training Workbook and Boost Your Interview IQ that have each sold thousands of copies globally. 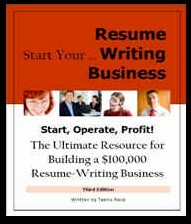 She provides job search and transition coaching for attorneys to administrative assistants and everyone else in between. This includes: FBI agents, public defenders, project managers, public relations professionals, product managers, sales people, accounting and finance people, high-tech IT experts, teachers, pre-med students, health care professionals, and even beauty queens. You can check her out at InterviewCoach.com. At one time, he worked as an HR leader and analyst for Lighthouse Research & Advisory, a research and advisory services company. 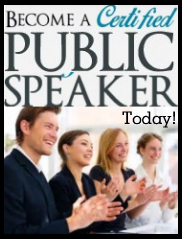 He spoke at conferences, co-founded and helped to run an “un-conference” for HR pros and business leaders. And he did all this while balancing a wife, twins girls and a little boy! 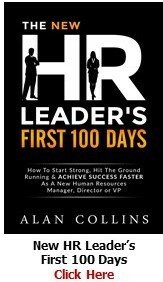 He started multiplying himself because he wanted to help make the HR profession better, one HR pro at a time. You can check him out now at upstartHR.com. Today, he’s taken things to the next level. He runs a business focused on helping HR technology vendors and service companies understand how to connect with the HR audience. Here’s the deal. I could easily give you ten more HR examples just like Carole and Ben and overwhelm you with more reasons why you shouldn’t limit your income to your HR day job. But for now, I won’t. Instead, I’ll let another celebrity do it. His name: Bishop T. D. Jakes. In the video below, Bishop Jakes talks about profiting from a variety of income sources. It does NOT matter is you’re religious, an atheist, or if you like him or not…his 7-minute MESSAGE is a powerful one that you should NOT ignore. 1. Don’t prostitute yourself to the highest bidder. 2. Every gift you have is a stream. 3. You should monetize those streams. 4. Start small with one stream. (It could be: freelance consulting, speaking, training, coaching, teaching classes, writing books and ebooks in an area that you have HR expertise in). 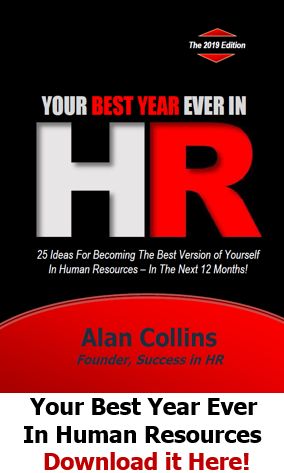 Those HR competencies that you have taken years to develop and use every day –whether it’s your expertise in hiring new people, building teams, creating compensation plans, resolving employee problems, using social media in HR, creating HR policies, retaining talent and the like — shouldn’t be confined to just ONE employer. 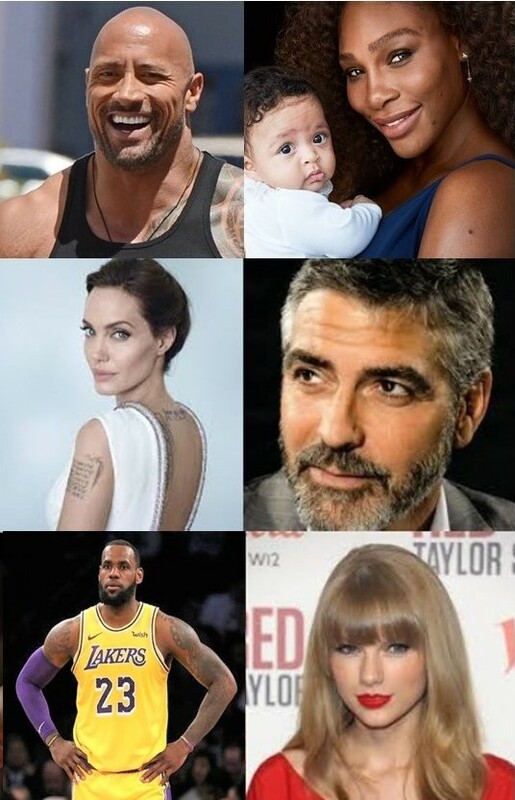 If celebrities like Angelina Jolie, George Clooney, LeBron James, Taylor Swift, T.D. Jakes…HR pros like Carole Martin and Ben Eubanks… and countless others like them, have NOT limited their income to doing just ONE thing …THEN WHY SHOULD YOU? 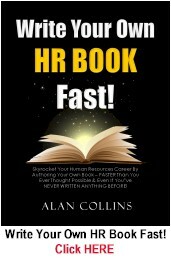 What are your thoughts on diversifying your sources of HR income? 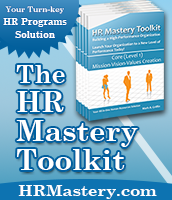 Are you maximizing your HR talents, skills and experience? Share your comments below by clicking HERE. Want to know ONE way to diversify your income on the side as an HR pro — while keeping your day job? 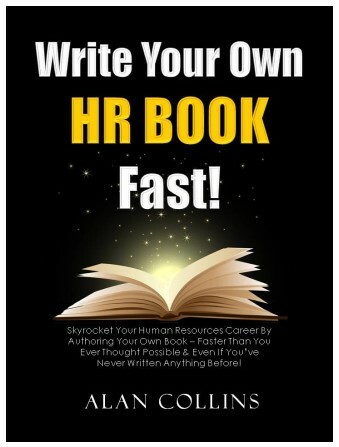 Then check out, WRITE YOUR OWN HR BOOK FAST! 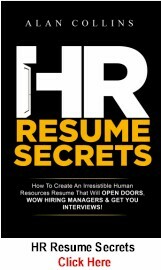 Take Your Career in Human Resources To The Next Level By Authoring Your Own Book — Faster Than You Ever Thought Possible & On The Side! Clearly, writing a book isn’t for everyone. But it’s easier than you think and yours will clearly separate you from the rest of the HR pack, while allowing you to capitalize on your HR skills and experience. If your own book is a goal for you either now or in the future, then you should check definitely this out. A SECOND alternative is creating small reports, white papers and short ebooks that address pressing issues or solve vexing problems. 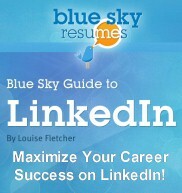 This is an even faster way of capitalizing on your HR skills, expertise and experience. 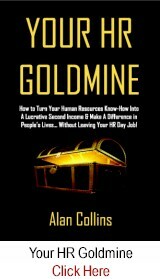 Then check out: YOUR HR GOLDMINE: How To Turn Your Human Resources Know-How Into A Lucrative Second Income…Without Leaving Your HR Job! This book will provide you with tons of ideas and a step-by-step plan for putting them into action. A THIRD way of capitalizing on your experience is to start as Ben Eubanks did, which is with your own HR blog. 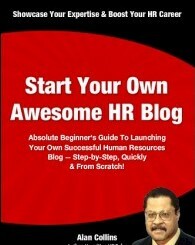 If you can write e-mail length messages and like sharing your ideas and experiences with others…then you’re in a great position to leverage the power of your very own HR blog. For more details, check out. 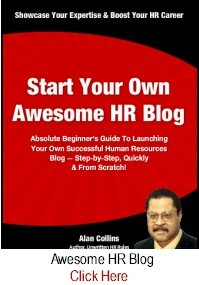 START YOUR OWN AWESOME HR BLOG: “The Absolute Beginner’s Guide To Launching Your Own Outrageously Successful Human Resources Blog …Easily, Quickly and Simply!” You can get all the specifics by clicking HERE. 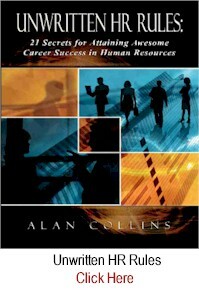 About the author: Alan Collins is Founder of Success in HR, Inc. and the author of a variety of best selling books for HR professionals. He was formerly Vice President – Human Resources at PepsiCo where he led HR initiatives for their Quaker Oats, Gatorade and Tropicana businesses. I always find your articles instructive and quite helpful. Thank you Alan. Great topic to cover, we have brought our HR careers to a certain level by obtaining certifications, attaining training after training, and networking. We have to use these to our advantage. Very powerful. Thank you, Alan.